With a tip capacity of 2,643 lbs. (1,198.8 kg), a rated operating capacity of 925 lbs. (419.6 kg) and maximum hinge pin height reach of 84.5 in. (214.6 cm), the radial lift path of the Vermeer S925TX makes easy work of lifting and dumping heavy loads. Vermeer has expanded its compact equipment lineup with the new S925TX mini skid steer, designed to provide impressive lifting performance and the power to conquer the most demanding applications, according to the manufacturer. The new mini skid steer features a dual auxiliary system, which allows the operator to switch between high flow for ground-engaging attachments and low flow for maximum control. It also is equipped with a universal mounting plate that fits a broad range of Vermeer-approved attachments. "From landscaping and tree care to rental operations, contractors are discovering that Vermeer mini skid steers can increase their daily productivity," said Jon Kuyers, senior global products manager at Vermeer. "With the S925TX model, we've designed a machine that can deliver a higher lifting performance than most other machines in the compact utility loader segment while still maintaining a compact size and impressive hydraulic attachment wielding performance." The new Vermeer S925TX mini skid steer is offered in three smooth-running, high-torque, four-cylinder engine options, including a 24.8 hp (18.2 kW) Kubota V1505 diesel engine, a 40 hp (29.8 kW) Kubota WG1605 gas engine and the 35.1 hp (26.2 kW) Kubota V1505 diesel engine offered only for international markets. Contractors can further customize their mini skid steer loader with either 7-in. (17.8 cm) wide tracks that produce 5 psi (.4 bar) of ground pressure or 9-in. (22.9 cm) wide tracks with 4 psi (.3 bar) of ground pressure for even better floatation. The S925TX mini skid steer has a travel speed of 4.1 mph (6.6 kmh). Like other Vermeer mini skid steers, the S925TX is built with a chariot-style platform for optimum operator comfort, and pilot-operated ground drive to help the user maintain smooth control on the job site, as well as in tight areas. 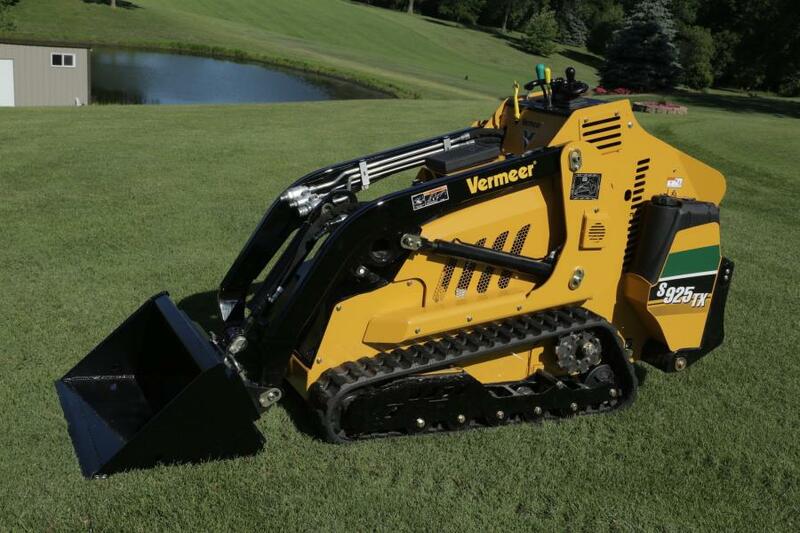 The Vermeer S925TX is backed by a three-year/3,000-hour extended limited warranty on the mainframe and loader arms for even more assurance and piece-of-mind on the job.